And for now… As a follow-up of my last post, I have produced a reading activity to go with the story my French students invented about Sarah and Kevin. 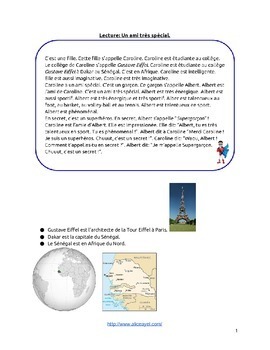 The story has different characters and location but it is based on the key structures “C’est / s’appelle / il, elle est …. / il, elle a …. / il, elle dit….” which are part of of Martina Bex’ storytelling unit for French 1: Dit. The reading doesn’t have to be the exact same story as the one your students invented but it should obviously include the same key structures. How do I proceed with the reading step? First, I read the story with my students and check for comprehension by asking questions in French such as “La fille s’appelle Sarah ? La fille s’appelle Caroline ? La fille s’appelle Caroline ou Sarah ? Comment s’appelle la fille ?“. So we do repeat the key structures and go through the facts of the story. Then, in order to make sure students understood what we read, I read a sentence from the text and let the students chorally translate in English. Since I have only three students, I can check easily if all of them understood the sentence. After having orally read the story, students can complete the three parts exercise of the worksheet. The first part is to again check comprehension with questions about the text and True or False statements. This is easy to complete as we have already gone through most of the questions orally. The goal here is to make my students confident about the fact they can actually understand a text in French! The second part is called “Vocabulaire” and the exercises are done to reinforce the use of masculine and feminine adjectives as well as the use of the “I” form: “Je suis… / J’ai…….“. Finally the third part is for my students to produce some comprehensible output. They should be ready now to use the key structures themselves and to tell their own little stories. You can find the document entitled: “French reading: un ami très spécial.” which you can download on Teachers Pay Teachers along with other useful resources! < Communicative activity for French learners (beginner level).